Much progress in humanity, though it is often one step ahead, two back, comes from symbolism, such as the iconic nature of photographs that pull at our conscience and tell us, “We must do better.” For decades now, the mostly black and white work of Dorothea Lange, the famed social documentary photographer of the Great Depression, has been such a tug. And rightly so, for Lange, employed by the Farm Security Administration but also shooting from her soul, was gifted in capturing candid and semi-posed expressions of many trails of tears, suffering, endurance, just plain grit, survival and resurrection in that economic debacle. Yet, her work, like that of any reporter of an age, must always be subject to re-interpretation, not only to dispel myth but to add to fact, to the constant, deeper understanding that betters humanity. 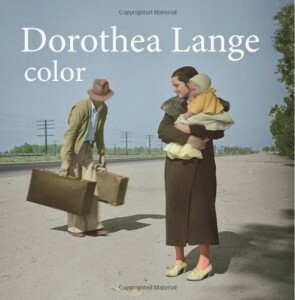 Recently, I was introduced to the works of three people, one a British graphics designer/photographer who has reset Lange’s images as color true to the age, and a sister team that wrote and photographed in similar fashion during the Depression. Neil Scott-Petrie from Cambridgeshire has produced an amazing tribute to Lange, and even more so, her social realism subjects, 1935-1939, by taking Lange’s black and white photographs and deftly and intricately adding accurate color. In doing so, he has brought realism to realism, and the viewer sees these iconic images of the huge ex-farmer migration from Oklahoma to California as if they were taken today. Previously, when we looked at Lange’s work, while we focused with empathy on the hungry, perhaps “lost” children and distracted adults in search of work, trying to survive in a great calamity, we also saw their period clothes, the Model Ts, filling station signs, etc. That caused us to set the age apart, apart from reality other than that moment. We saw the images almost as fine art pieces, set for a museum installation. But with Scott-Petrie’s reworking of Lange’s shots, we view another time in humanity’s long struggle relative to today. And that is much to the good. Indeed. I would urge Scott-Petrie to seek wider viewing of his added perspective of Dorothea Lange’s defining reportage, perhaps in a national gallery installation in London or New York. They would be a sure hit and would add to the story of humanity in struggle, a continuing novel that sees chapters even today in the worsening immigration problem in the United States. (Neil Scott-Petrie’s “Dorothea Lange, color, The Migrant Experience 1935-39” may be accessed via dorothealange.com). Lange was not the only social documentary reporter of the Great Depression. Also there were the Babb sisters, Sanora, a writer, and Dorothy, a photographer. Joanne Dearcopp, a longtime friend of Sanora, reminds me that Dorothy photographed migrant camps in the late 1930s and her sister wrote the novel, “Whose Names are Unknown.” Therein lie many stories. Sanora helped establish the FSA government camps for migrant workers in California, and her Dust Bowl refugee novel began there. Apparently, Random House was planning to publish this “exceptionally fine” writing but later claimed the market was saturated with the bestseller “The Grapes of Wrath,” the classic John Steinbeck novel on the same subject. In 2004, the University of Oklahoma Press published Sanora’s novel to strong appreciation and recognition that there were other incisive voices reporting on the Depression years and its social issues. Sanora’s sister Dorothy was said to have offered literary criticism to her, and the former’s photographs, some 250 or so, provided their own exceptionally compelling reportage of Dust Bowl refugees. In this America of today, not recovered from a recession of a few years back that almost became a depression, in a United States that must make choices that better humanity rather than harm it, choices over a dwindling middle class, immigration, health care, political direction and world responsibility, revisiting the social documentary work of Dorothea Lange through Neil Scott-Petrie’s added perspective and through the writings and photographs of the Babb sisters, makes us understand better the journey so far and reminds us of the utter responsibility we have for each other. I had a friend named Ginny, who was a fellow trustee at the Edward Hopper House Art Center in Nyack, N.Y. A very effective communicator, she was particular about doing things right, to a standard, and she spoke her mind in polite but underscored words. Ginny was outgoing, quite sociable and gathered lifelong friends wherever she lived — in New York, Boston, Chicago, elsewhere. To the individual, she was all ears, as if you were the only one she ever spoke to. She was a feisty debater, even playing the devil’s advocate when she was in argument over similar beliefs. That all this, her lifestyle, brought smiles to Ginny’s face, especially in her last years in South Nyack, N.Y., was a blessing for her and the people she touched. A vital part of that picture was her beautiful 1850s home on Clinton Avenue, a gracious structure not unlike Ginny’s own bearing. She bought the timeworn but well-constructed house from the Deed family, which was appropriate because it had been owned by Bob, once a journalist and then a book writer. Ginny could not live anywhere where words were not well spoken, read, written. This house was a sure fit. assembled just the right tradesmen, almost adopting each fellow who came into her circle. In turn, these people learned that mother wanted things done her way, and that meant realigning molding if it was off level or not mitered exactly. It meant replacing and redoing work. In the end, the house became a home and quite beautiful at that. Ginny also depended on a few people who volunteered repair work, but she held these men and women to the same standards as the paid tradesmen. I was privileged to be in that volunteer group, installing such things as deadbolts, electrical fixtures and radiator valves. The last time I saw Ginny Garbers was on a repair job, which by then had become an excuse for conversation and some wine, for debates on government, for talks about art and Hopper House, for quiet, mutual pause, for the slightest mention of an illness that would soon take her life. On that last day, Ginny greeted me at the door, this beautifully restored original entrance that had opened to visitors long before automobiles and electric lights. She had a shiny brass knob in her hand, meant to replace the original, which would pull off its shank from wear. Ginny had searched far and wide for just the right knob, sending back one that was too small. The proper handle arrived, she called me, and when I got to the house, Ginny met me with a huge smile as she held the shiny knob in her hand. I set out to install it, Ginny hovering in her usual foreman’s stance. Install not once but four times, so that the feel was just right, just right for Particular Ginny. I did get it right, and then we sat down in her well-finished living room to conversation that ran all over the place and some red wine labeled “Menage à Trois,” a French reference that Francophile Ginny laughed about. At some point, the usual-of-late, delicate, not prying but concerned question came up: “How is it going?” Ginny, though she kept health and other private matters in limited conversation, as was her upbringing, did mention her nighttime pain, her rejection of another chemotherapy round and wondered out loud, “I just don’t know how long …” We dropped the subject and shared more words on this and that. It was time to leave, and Ginny, with another huge smile on her face, went to the door, took the polished brass knob in hand and grandly opened it. It was almost as if she had yet another beautiful child to glow about. So full of life Ginny was that day, just weeks before her passing, that you could not have expected it. Maybe six months, I thought, maybe a year. I’ll be here again. But I did not return. Nor did the many friends Ginny had. Now, the door knob, the final capping of her home, so appropriately placed at the entrance to her grand achievement, will serve to welcome other life, as Ginny Garbers would have it. Job completed, in her particular way. But I did not return. Nor did the many friends Ginny had. Now, the door knob, the final capping of her home, so appropriately placed at the entrance to her grand achievement, will serve to welcome other life, as Ginny Garbers would have it. Job completed, in her particular way. How do you thank a son, who at 43 this very day, July 14, is light years ahead of who you were at that time? How do you speak, father to offspring, beyond a pat on the back and saying “Happy Birthday”? Effusive emotion is a non-fitting suit for both. Conceived in the uncertainty but — still — progression of youthful marriage, when a career with all its pulls and pushes was building, and with all the worries about this and that so much heavier than the carefree years just before, the birth nine months later of a little being never in your world changes that world, whether you are prepared or not. That the first son we had, and then his brother, too, would bring me, especially, to greater maturity and some accomplishment in meeting needs and standards is a gift from both. One that keeps on giving. Parents are proud of their children, as they should be. Today, expansive social media such as Facebook announces that to the entire world, and that sort of spotlight may be like endlessly watching the neighbor’s old 8mm home movies. It is far better, perhaps, to have others acknowledge, without prompting, that your children are good people. In our case, we are fortunate not only because the sons are such, but they don’t bring attention to the fact. After all, the first requirement of living is to be a good person, and the second is not to expect applause for that. It’s my hope that all parents out there see in their children the individuals they are, that they find their offspring secure in every way, for even with the child now well grown at 43, you recall tucking in at age two. You never stop tucking in the son, the daughter. If the child achieves, in career, in being a good person, in expressing traits others admire, in succeeding on the job, in being a parent himself, herself, if that happens, in progressing through the years by following the standards we all should expect, then you see on that person’s annual natal day a renewed gift coming to you as well. For parents such as myself, blessed with two fellows who have surpassed expectations, saying “Happy Birthday” to each of them is our own blessing.